PVC/Galvanized Gabions - Buy PVC/Galvanized Gabions Product on Hebei Gabion Hardware Wire Mesh Co., Ltd.
Galvanized wire mesh is a molding production, in addition to the cover plate, side plate, end plate and bottom plate segmentation, can not. Galvanized wire mesh is a molding production, in addition to the cover plate, side plate, end plate and bottom plate segmentation, can not. Length / width tolerance (+ 5%) height tolerance (+ 5%), every 1 meters inside the partition separated into independent units. Galvanized wire mesh of the assembly, cover plate, plate, plate, plate production and assembly into a single cage, each part with spiral steel wire wrapped in silk, all edges are coarse wire strengthen Gabion strength. 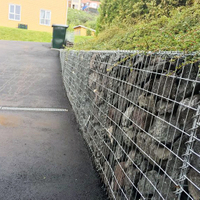 Galvanized wire mesh combination is good: convenient transportation, according to the design requirements tied into various shapes, to adapt to the hillside, beach and the shape of the embankment. Galvanized wire mesh is a kind of eco grid structure. Gabion low carbon steel wire, high corrosion resistance, high strength, ductility or PVC coated wire using the above machine woven, gabion gabion cage is made of Gabion. 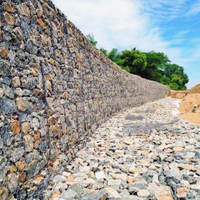 Gabion edge line diameter is larger than the wire diameter. The double stranded part is twisted. In order to ensure that the part of the wire strands of metal plating and PVC coating damage. 1 galvanized wire net rivers and flood control and guide. 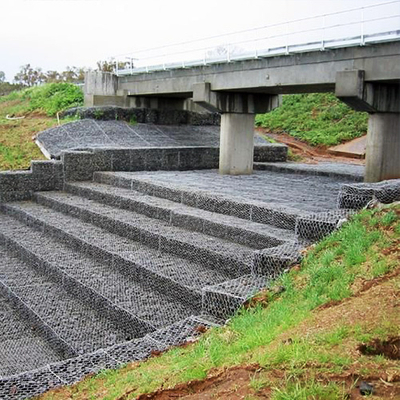 2 galvanized Gabion release flood waters dams and diversion dam. 3 galvanized wire mesh pad rockfall protection. 4 galvanized wire mesh cage to prevent soil and water loss. 5 galvanized wire mesh | gabion mesh bridge protection. 6 galvanized wire mesh of solid earth structure. 7 galvanized wire mesh coastal defense construction. 8 galvanized wire mesh in port engineering. 9 galvanized wire mesh | gabion retaining wall 10 road protection. Galvanized wire mesh structure can be used in the slope, excavation, rock surface mesh shotcrete slope, vegetation (green), stone cage net is also made of Gabion, gabion mat for rivers, dams and seawall protection against erosion and reservoir, river closure. Rivers and flood control and guide: one of the most serious disasters rivers flow to river erosion destroyed, flooding triggered floods, resulting in great losses of life and property and the amount of soil and water loss. 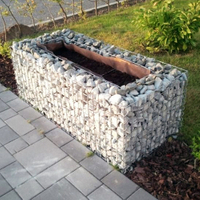 Therefore, in dealing with these issues, the application of the grid structure to become one of the best solution, gabion mesh can be permanent river bank protection. Channel: channel canal bed construction, relates to the slope and river bed stability. Therefore the selection of mesh structure, is the main method for many hundreds of years of natural river renovation and artificial excavation of the channel. 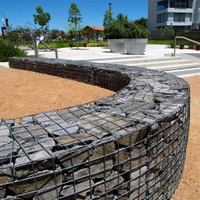 It can be effective permanent protection of the bank or bed, control water | gabion gabion net flow, prevent water loss function, especially in environment protection and maintaining the water quality, with excellent effect. Slope revetment: grid structure of ecological revetment and its application and the river slope protection is a very successful example, which give full play to the advantages of galvanized wire mesh | gabion mesh, to reach the ideal result of other method cannot achieve.